Video released of car break-in behind law school | Crime Stoppers of the Lowcountry: 554-1111 | 1-888-CRIME-SC | Anonymous tips earn cash rewards with Crime Stoppers of the Lowcountry. CHARLESTON, SC (WCSC) - Police are looking for a man they say broke into a woman's BMW and stole $300 worth of jewelry near the Charleston School of Law last Sunday. Charleston Police Department has released surveillance of the suspect, a black male who appears to stand between 5'8" and 5'10" and weigh around 250 pounds. He was wearing an orange short-sleeved shirt with white stripes down the sleeves, khaki pants, and dark shoes. Police say the robbery happened around 5:55 a.m. in the lot behind 476 King Street. 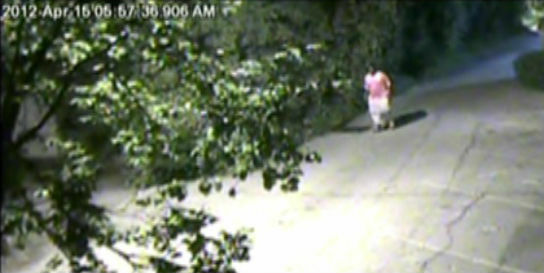 In the video above, the suspect is seen walking towards Mary Street before dropping a handbag in the bushes and continuing to walk toward Ann Street. If you have any information, call Crime Stoppers at 554-1111.